Under ideal hiking conditions,14 of us met in Ormos Korthi. We came from various parts of the island ,Fellos, Ano Gavrio, Katakilos, Palaiopoli, Chora, Katakalei, Ormos Korthiou and we started the day by taking a bus to Dipotamata. The atmosphere on the bus can only be described as joyful in anticipation of walking outdoors on such an idyllic day. After a short briefing on our way to the start point we left the bus and then started the descent to the gorge of Dipotamata with its amazing arched bridge between old watermills. The many streams in this area were not only a delightful glistening spectacle but they provided magical sonic backdrop. Arriving at the top of the gorge we stopped for a few minutes and after a short discussion the whole team decided to continue up to the Upper Castle. The good weather and the even better visibility allowed us to admire a fantastic view of the Aegean from above. From the Upper Castle we went down to Kochylou and on to Ormos Korthiou arriving in the afternoon. 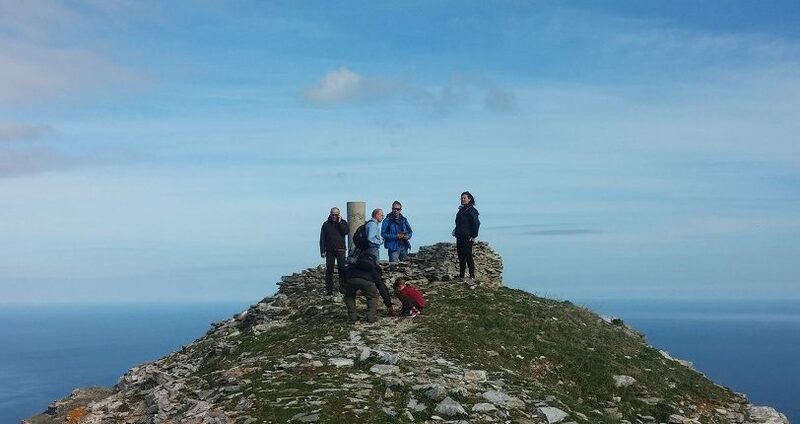 Throughout the walk, we pruned back the new growth, picked up fallen stones and placed them either on adjacent dry stone walls or at the edges of the “stenis”. We fixed way markings along the route (revealing hidden signs and re-fastening those that had fallen) and made a record of all of the problems we encountered. We ended the day with a pleasant meal and soon forgot our tired legs in the same spirit of joy as we started the day. A big thank you to the whole team for their efforts and we will be waiting to welcome them on the next maintenance walk that will be announced soon!